The Smith and Wesson M&P Shield is one of the most popular subcompact handguns out there, and they’re particularly useful for conceal carry. 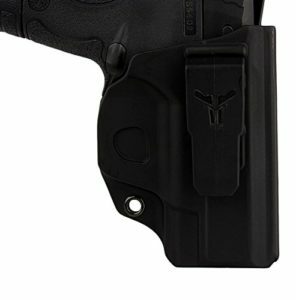 Having a gun almost made for concealed carry means getting an IWB holster might be a decent idea. We’ve put together a list of what we think are the top IWB holsters for your M&P Shield on the market. Later, we’ll tell you what our favorite choice for the everyday gunowner is. We’ve done all the hard work of eliminating the not so good choices out there (it’s easy for anyone to be tricked online into paying for cruddy craftsmanship). Before you go out and buy any holster, though, you’ll need to consider your wants and needs in said product. You’ll have to decide what type of material will be most comfortable for you to wear over or under a shirt. 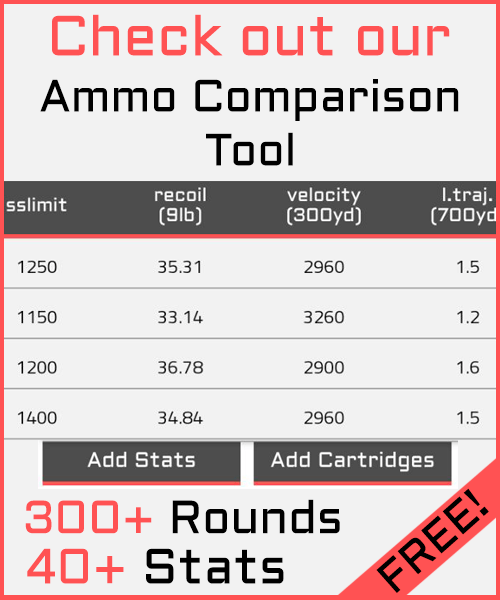 You’ll have to consider your budget as well as for how long or frequently you’ll be wearing your IWB holster. Finally you should think about any accessories or attachments you are carrying on your gun. Almost all holsters are perfectly molded to the shape of the weapon they are made for, so any light attachment won’t fit. Usually you don’t have to worry about night sights since those are most of the time of similar size than the stock ones. We think our top picks, listed below, will cover most of the needs of the average conceal carry owner. Materials – The Pro Carry M&P Shield IWB Holster is made of an all black soft and pliable leather. There is stitching at the top of the holster, around the clip, and over the trigger guard to keep a secure fit while still allowing the material to bend and adjust to movement of the wearer throughout the day. The single waistband clip is made of gun blued metal. This holster is not much larger than the Smith and Wesson M&P Shield itself, so it takes up as little room as possible. Any retention is reliant on friction between the holster and the wearer. 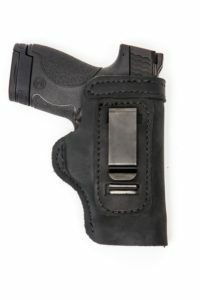 Performance – The Pro Carry holster is the best holster for M&P Shield owners that need an incredibly budget friendly holster with a focus on comfort. The pliable leather is the greatest asset to this holster. It’s soft and durable enough to wear all day while going about daily activities or even sitting for most of the day. While the material is comfortable, and grip and back end of the handgun is still exposed, so make sure to wear a soft shirt between the gun and yourself. That being said, if you require something more durable than this, look elsewhere. This holster isn’t the best for keeping your handgun protected from other elements. What we say – You’ll only need to pay around $30 for the Pro Carry IWB Holster Shield Series, which is an amazing bargain as far as holsters go. If comfort is your main concern, then this is a great choice for you. If you experience a little wear and tear, they’re still cheap enough to purchase a replacement! Materials – The Blade Tech Industries holster is another budget friendly purchase that takes a different angle, and it’s the best IWB holster for Shield models that is compact and significantly more durable than the previous holster. This holster is made of an all black super tough polymer that is molded to the shape of the Smith and Wesson M&P Shield gun. It includes a trigger guard lock that delivers and audible click when the gun has been properly holstered. 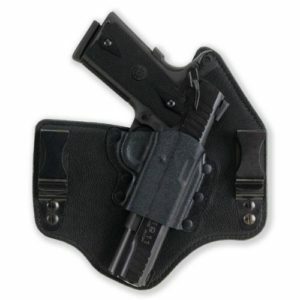 There is a clip attachment, which allows the holster to be worn appendix style as well as inside of waistband style. Performance – We love that the Blade Tech Industries IWB Holster Shield series still keeps cost and a compact design in mind while offering a heightened durability and level of protection for your conceal carry. We did notice that we really needed some extra padding while wearing this holster because the polymer is pretty tough against the body. We also don’t suggest this holster if you spend a lot of time sitting at a car or in a desk. Overall, you can feel very confident while wearing this holster. What we say – You’ll also only be paying around $30 for the Blade Tech Shield IWB Holster. This is a great choice for anyone who is very active or needs an extra layer of protection for this conceal carry. 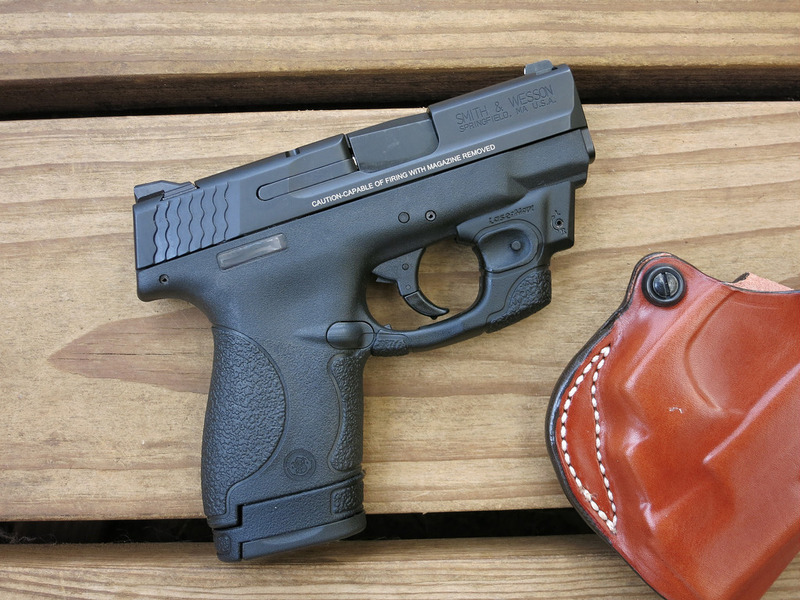 Your Smith and Wesson M&P Shield won’t rattle around or slip out while using this holster. Materials – The Galco Kingtuk Shield IWB Holster is made of an all black combination of leathers and kydex. The panel that protects the body is made of lined saddle leather on one side and Napa leather on the other. The holster for the handgun is made of strong kydex. 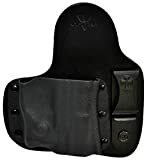 The wide leather panel offers surface area and a distribution of friction, and the kydex holster ensures that your weapon is well guarded from scratched or scrapes. The two metal belt clips can be moved and adjusted, so the wearer can position the holster at an angle he or she chooses. The Galco Kingtuk holster has been used by law enforcement and the military. Performance – We think the Galco Kingtuk holster is the best IWB holster for M&P Shield models because it offers the comfort of soft leather and the durable kydex to protect the conceal carry. We also really love that the metal clips can be adjusted, because many IWB holsters with a back panel don’t allow for much movement. Our only complaint is that all of these materials makes the entire holster a little bulky. While it fits snuggly, this is another holster that isn’t ideal for sitting with in a car or at a table. What we say – While the price is a little higher, you’re still not break the bank with this holster. It will cost around $65 online, which isn’t a terrible price, considering it’s mostly made of quality saddle leather. This is the best M&P Shield holster for anyone who wants the best of both worlds for comfort and protection from scuffs. Materials – The Viridian Reactor IWB holsters for M&P Shield are beautiful and high quality holsters that allow the gunowner to wear their conceal carry at the front of the waist. This holster is made of a soft cowhide leather, as is the panel that distributes friction against the body. The holster covering the barrel of the gun is made of a CrossBreed hand molded pocket, so the conceal carry won’t rattle or slip during daily activities. It has been specially designed for pistols equipped with Viridian Reactor Series lasers and lights, which will automatically turn on when the gun is drawn. Performance – The Viridian Reactor Series holster is the best IWB holster for M&P Shield pistols thanks to the hand molded pocket and comfortable leather. We love that this one offers a slightly different feature of omitting any cant, so it can be easily worn at the front of the waist for shooters who prefer a cross body draw. This also makes it dramatically easier to wear the holster throughout the day while bending or walking frequently. There’s very little to complain about, unless wearing it at the front of the body just isn’t your thing. What we say – The Viridian Reactor Series holster runs anywhere between $75 to $100 online, making it the most expensive choice on this list. However, if you’re not of fan of having your conceal carry on the hip, this is the best M&P Shield holster for you. If you think you’re fairly active during the day, or you simply intend to wear your IWB holster during most of the day, then we highly suggest considering this purchase. We think the best IWB holster for M&P Shield pistols is the Viridian Crossbreed Holster. Although it is the most expensive product within this review, it is still surprisingly affordable for the craftsmanship and materials it’s made with. We understand a forward positioned holster may not be everyone’s first pick, but it eliminates the struggle of finding a holster that sits on the hip that also allows the wearer to move about freely and sit or bend over as needed. This is one of the most comfortable holsters we’ve reviewed. Despite the softer leather material, the hand molded pocket for your Smith and Wesson M&P Shield will still keep your weapon confined and secure. We absolutely the Viridian Reactor Series is the best IWB holster for Shield conceal carries.